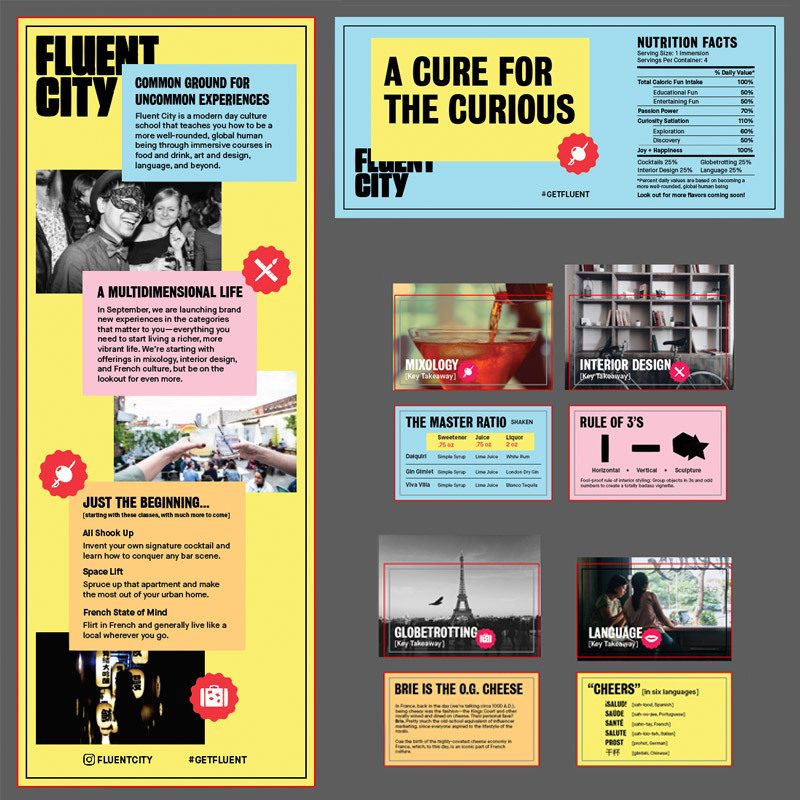 Fluent City is a modern-day culture school that teaches 10 languages, cocktail-making, interior design, and culture across 4 cities. We relaunched in September 2016. At the beginning of August, we found ourselves extremely behind on schedule; our site was set to relaunch in 3 weeks and our launch party was 10 days away. Our PR agency had fallen through on planning the party, so it was up to our internal team to create something out of nothing. 1/ 8 days. $400. What could we do with that? The first step was to consider our new brand personality and how we wanted to portray that with our press takeaway. Pictured left are the 4 main pillars of our new personality (taken from Style Guide). It was time to scrap some of those bigger ideas and consider our resources. What was something that would convey our core values, show off our new brand personality, AND be cost-effective? That's when I came up with this "message in a bottle" idea. A message in a bottle is surprising, delightful, and unexpected. To make it more current, I thought of using mason jars. This jar would contain everything that press needed to know about our new brand. You can see my initial drawing on the right. Ultimately, the bow was scrapped and we decided on using a unique nutrition label as decoration for the jar (this idea came when I was grocery shopping!). The next step was to print a copy of all designs and put them all together—to make sure everything would fit and to be sure this jar represented everything that we needed it to. Passionate: It's colorful, interesting, and out of the box. Hospitable: Inside, it would have the 4 things that guests would learn over the course of their evening—a "gift" of knowledge. Unconventional: The final design used a nutrition label with information that was related to our brand. Real: It is way more three-dimensional than a magazine. It's also something that can be repurposed and used for something else. This was rather tricky, as we had to stay within budget. My initial thought was to buy a massive pack of mason jars from an art store; I knew they weren't too expensive. But that's when I found a local jar supplier in Brooklyn—and they had these fun jars with the black top, which were much more unique than the typical silver ones. For the stickers, we printed them via StickerMule—we needed something simple, easy, and quick. For production, we had a quick assembly line process; I luckily had the help of 2 other team members. One person for sticking labels onto the jars, one person for rolling up the scroll, and one person for sorting the takeaway cards. 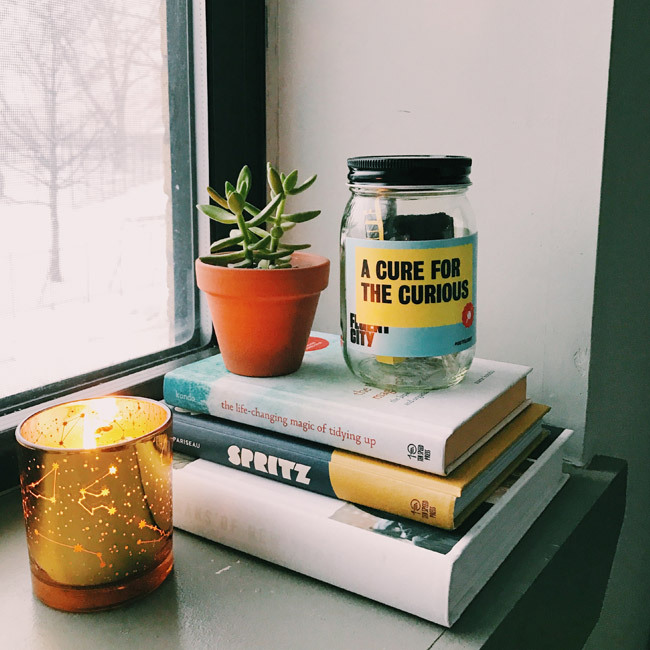 80 of these jars were created—all within our budget of $400. The best part? We received rave reviews from all guests at the party that received one of these. We had found an unexpected way to connect with our new audience. Jars out in the wild!